All eyes are on San Francisco's waterfront, as the city prepares for the 34th America's Cup, to be held in San Francisco in 2013. The recent release of Port City: The History and Transformation of the Port of San Francisco, 1848-2010, provides the opportunity to look back at the long and varied evolution of the eastern edge of the city as we envision its future. This Wednesday, May 11, Port City author Michael Corbett and San Francisco Architectural Heritage’s Mike Buhler will discuss the book at a SPUR lunchtime forum, Port City: the transformation of SF’s waterfront. The book provides an in-depth study of how the Embarcadero, Ferry Building, piers, waterfront infrastructure, and neighboring streetscapes evolved over the last 160 years. Although San Francisco is no longer a true “port city” (that title is more befitting Oakland and other major commercial ports), its deep ties to the water are still evident in the traces of historic features along the Embarcadero. Railroad cars, Model Ts, bicycles, and streetcars are just a few of the modes of transportation that have co-existed on the Embarcadero. The Market Street Railway Mural by Mona Caron offers a great overview of how transportation has evolved in San Francisco over time. The Embarcadero offers an equally interesting snapshot of the intersection of these modes, with traces of historic railroad tracks and other evidence of outdated transportation modes still evident today. 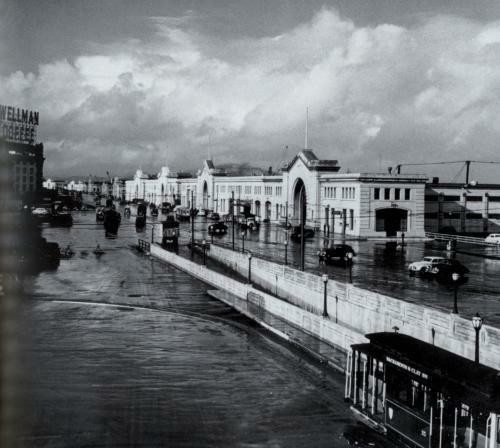 1940 view north along Embarcadero from foot of Market Street (Port City, pg. 24). The original Ferry House stood at the foot of Market Street from 1875 to 1896 and was a long wooden shed with a central tower and a long arcade across the front. In 1892, planning began to replace the Ferry House with a new, efficiently planned building designed by A. Page Brown. The Ferry Building (as we know it today) was first occupied in 1898 and completed in 1903. 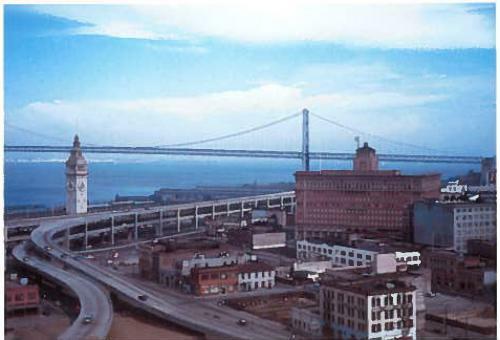 The building was the first structure along the Embarcadero to display refined architectural design, as the industrial nature of the piers and support structures were carried through in their functional appearance. The Ferry Building served as the physical and symbolic hub of San Francisco’s transportation lines: marking the convergence of railroads, ferry service, street and cable car lines. 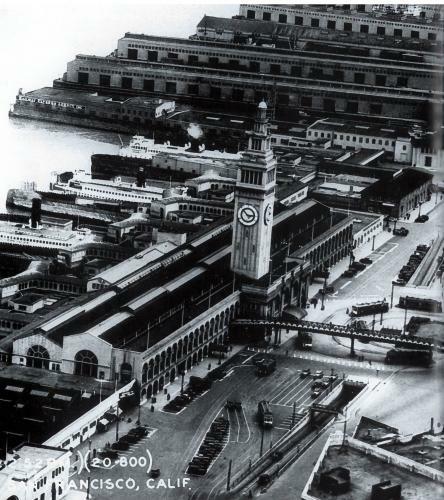 Although the Ferry Building was a celebrated focal point of the Embarcadero during its early years and has been revived as such today, this was not always the case. The Ferry Building and Embarcadero were blocked by the Embarcadero Freeway beginning in 1959, creating a dramatic physical barrier between the waterfront and the city. The freeway was damaged in the Loma Prieta Earthquake in 1989 and removed in 1991. The pronounced vision of this obstacle lives on in the opening credits of The Streets of San Francisco TV series, which ran from 1972-1977 and provides a campy snapshot of San Francisco in the 1970s. The Ferry Building now stands as the city’s celebrated, revitalized central marketplace, but it's easy to forget the not-so-distant past, when the building was physically separated from the city by this major artery. For a short documentary about the lessons learned from the Embarcadero Freeway, view this video by streetfilms. The industrial piers that flank the Ferry Building, extending along the entirety of the eastern waterfront, functioned as a loading and storage point for cargo coming in and out of San Francisco via ships and rail. 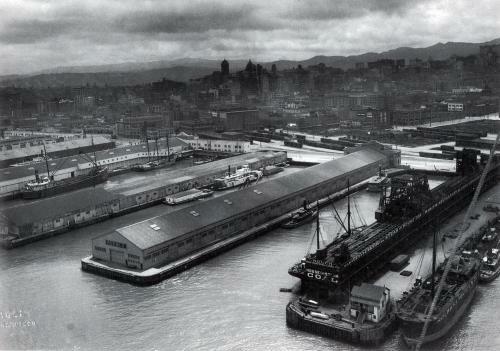 Cargo was transported from the piers to inland warehouses and factories, and railroad lines terminated inside many of the piers for maximum ease of loading/unloading cargo. Some of the most innovative reuse projects in the Bay Area are happening within these former industrial structures along the waterfront. The piers have been transformed into high-class restaurants and watering holes, a photographic archive, office and retail spaces; and plans are in place for a museum, a cruise terminal and other services and attractions for residents and tourists. The piers are an important component of the waterfront revitalization that seeks to bring activity and focus back to the waterfront, while preserving the character of these historic structures.